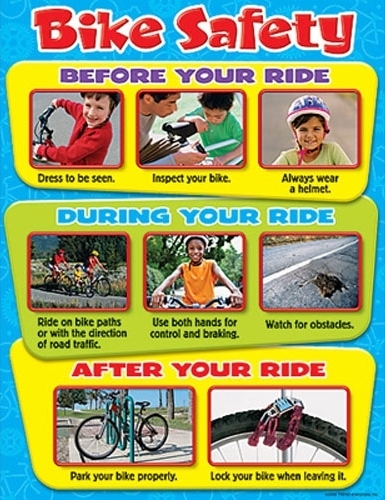 Bicycle Safety: Cycling is a fun, healthy activity and an inexpensive way to get around. As the spring weather arrives, many of our students enjoy riding their bicycles. 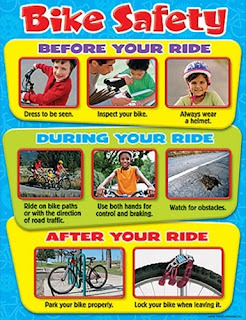 Make sure that you remember the safety rules and ride safely! · A helmet can greatly reduce the risk of permanent injury or death in the event of a fall or collision. A helmet works by absorbing the forces of the crash, so if a helmet has been in a collision, it should be replaced even if there is no visible damage. To provide maximum protection, the helmet should fit level and square on your head. It should fit snuggly and not slip when you move your head. In Ontario, it is the law that every cyclist under the age of 18 must wear an approved bicycle helmet. · Clothing can improve or reduce visibility. Yellow and white stand out best at night; dark colours are difficult to see. Pedal reflectors and reflective material on wrists, ankles, heels, clothing and helmets help others see you. · By law, all bikes must have a working bell or horn to announce your approach. At times it is just as effective and more courteous to shout something like "passing on the left" when overtaking other cyclists and pedestrians.